The words that have children across America hankering for more! Goodness, that’s a string of words you don’t often encounter in modern western society. Spicy Seaweed Ramen. A spicy ramen, made with seaweed. It’s hard to imagine that the Trader Joe’s marketers are expecting this one to find very broad-based support. It’s not exactly like suburban kids across the nation are whining to their parents about their seaweed-based Asian soups being overly mild. In any case, Trader Joe’s has thrown their hat into the ring with this new dish – and scored a solid hit. I love ramen. I’m eating ramen right now. But ramen has something of a schizophrenic existence in America – supermarket ramen and restaurant ramen. In recent years ramen has managed to earn itself back something of the sophisticated glamor shared by it’s cousins soba and udon. But it still has to contend with its dark past – with the cups of brittle styrofoam found in supermarkets and college student cupboards everywhere, with the ubiquitous “Cup of Soup”. For many Americans, perhaps even for you, good reader, “Cup of Soup” dehydrated ramen noodles was the first way they encountered this popular Asian dish. It certainly was for me – and I managed to eat so many between freshman and sophomore year of college that I haven’t touched another one to this day. It’s not just an American phenomenon either. Japanese supermarkets have entire aisles dedicated to variations on super cheap, dehydrated ramen bowls – some with barely redeeming qualities, some too horrible to describe. So as curious as I was about the spicy seaweed aspect of this soup, I was even more curious about the Trader Joe’s take on supermarket ramen. Would they succeed where none others have? Would they manage to introduce a tasty, ready-to-make ramen for the masses? 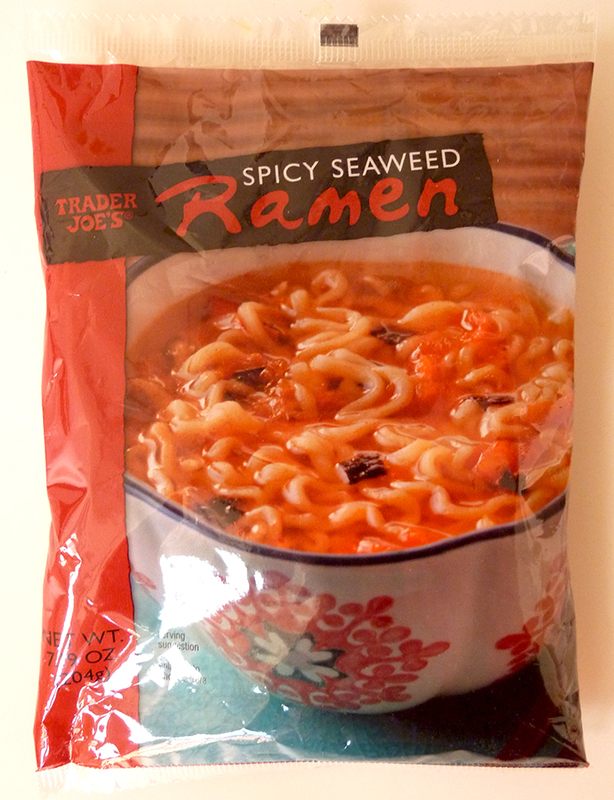 The first thing you’ll notice when you pick up a pack of Trader Joe’s Spicy Seaweed Ramen is that it’s no mere sachet of dry noodles. The ramen is precooked and held in al dente stasis in a plastic pouch that comes packaged with a healthy quantity of soup base, and a a small packet of crumbled seaweed. Cooking is quick and easy, a simple matter of introducing the pre-prepped noodles to boiling water for five minutes or so, followed by the addition of the rue and topping. The soup comes off the stove top looking and smelling delicious. The spicy looking red yellow broth swims with little goblets of hot oil, and the aroma of red pepper threatens the nose with a small but waiting fire. There’s more bark than bite to the ramen, however. The spiciness is exactly what you’d expect from a mass-market supermarket variety – a little bit hot, but sure to be palatable by all but the most milquetoast. Even I was able to slurp down the noodles, and I’m a well known chili wuss. The noodles, by the way, are tender, toothsome and tasty. I’m not sure how they do it there at Trader Joe’s, but I’m consistently satisfied by the texture of their precooked pastas (see: Minestrone, Couscous ChoppedSalad). It’s a tight package – quick, easy to cook, tasty and unique, that leaves very little to nit pick. That said, I have spent some time roaming the Exotic Orient, and seaweed is a something I consider a tasty snack. It’s presence in this ramen dish is slight, the dark green flakes are immediately absorbed into the broth and become something more like a dusting of oyster cracker crumbs then anything else. Personally, I thought Trader Joe’s went a little too light on the seaweed – Its cheap, guys! Give us a second packet! – but it’s mild presence here is unlikely to offend the xenophobic or PB&J set. A final quibble, the broth is fairly straight forward and uninteresting. This is surprising given the lengthy list of ingredients going into it: clams, anchovies, soybean paste, shrimp, kelp, and more. A really excellent soup tends to tease your tongue with the broth, but this ramen doesn’t manage to aspire to those lofty heights. Would I Recommend It: I would. Get some! Would I Buy It Again: A good, international soup at a reasonable price? Absolutely. Final Synopsis: Well done Trader Joes. Now lets see about some new flavors.